OTF-1200X-60HG is the most safe hydrogen tube furnace in the world . 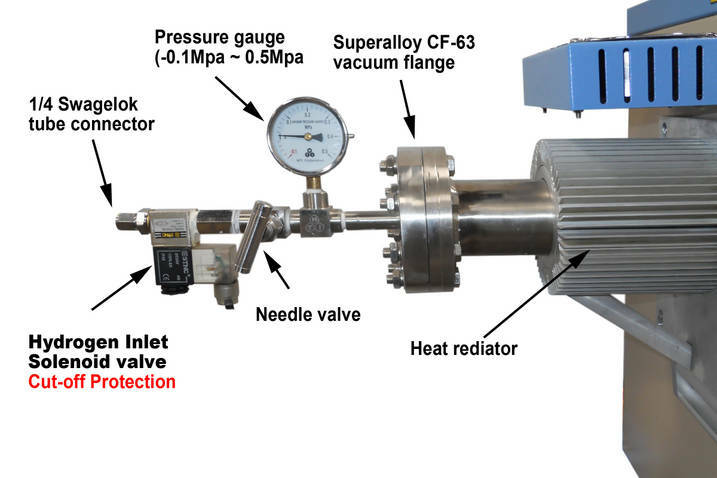 The processing tube is made of high quality Ni-based super-alloy which never crack and broken at flowing Hydrogen gas and a small hydrogen generator is included in the system. One 3M hydrogen detector is included which will shutdown Hydrogen gas generator and gas inlet valve immediately once detecting hydrogen gas leaking . The tube furnace is designed for processing material under hydrogen gas up to 1100°C safely. Also the furnace can be used for all kind of inert gases and oxygen gas up to 30 PSI. Precision temperature controller is 30 segment programmable. 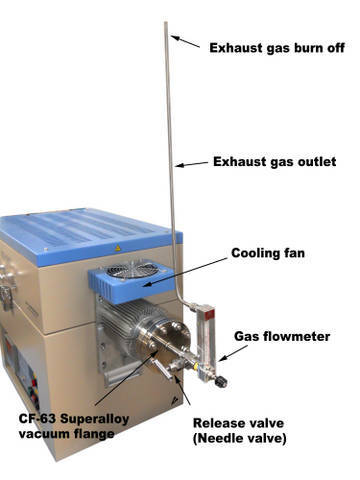 The hydrogen gas furnace must be placed under fume hood which is not included. Please click to view the spec of MTI EQ-FH-36 fume hood. Two sets of CF-63 flanges are weld on two ends of tube which allow high vacuum up to 10E-5 torr and 30 PSI positive pressure. 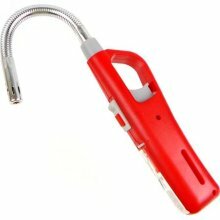 One long lighter is included in the standard package for igniting hydrogen gas manually. One 3M hydrogen detector and power supply are included ( click underlined for detail specification. RS485 port is installed in front of panel for PC connection. Click here to review detail information. click to view details QL-500 is a compact & light weight, save & cost effective , energy-saving & environmental friendly advanced hydrogen generator. It producing extremely pure hydrogen gas through the electrolysis of pure water without adding any alkaline. It can produce continuous / high purity H2 gas up to 500 ml/min with digital flow rate display, valve regulation and over-pressure safety protection. This generator is idea device to supply H2 gas for material processing, heat treatment and gas chromatography analysis, etc. in research laboratory instead of using heavy, expensive and unsafe hydrogen cylinder. Note: the hytrogen detector has been set up to attach the hydrogen generator. When the alarm is activated the detector will immediately shut off the hydrogen generator to cut off the hydrogen gas input line in order to ensure the high level safety operation. 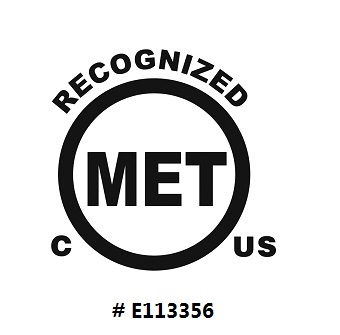 Compliance Components: Temperature controller is Met certified.